BCG predicts the fastest growing segment in robotics will be those designed for “personal” uses like education, cleaning, and entertainment. After years of flying under the venture capital (VC) radar, the robotic industry is finally starting to see a remarkable growth in funding traction. In 2014, VC investments in robotics rose 36% to $341.3 million up from $250.7 million in 2013, according to Travis Deyle’s annual robotics review. The spike in 2014 investments follows what Deyle believes was a “frothy” funding environment, influx of drone startups, and later-stage medical robots. As a whole, the robotic industry continues to be dominated by industrial and manufacturing products. While this will continue to be the most prominent application, BCG predicts the fastest growing segment in robotics will be those designed for “personal” uses like education, cleaning, and entertainment. Although robotic VC funding is growing annually, these investments must be viewed in greater context. 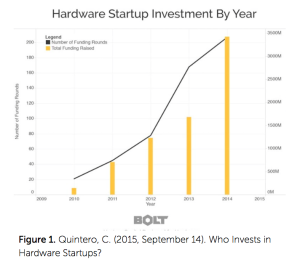 The increase in robotic funding follows the general venture trend of increasing investments in hardware startups, which have increased more than 30x from 2010-2014 (See Figure 1, Hardware Startups by Year). 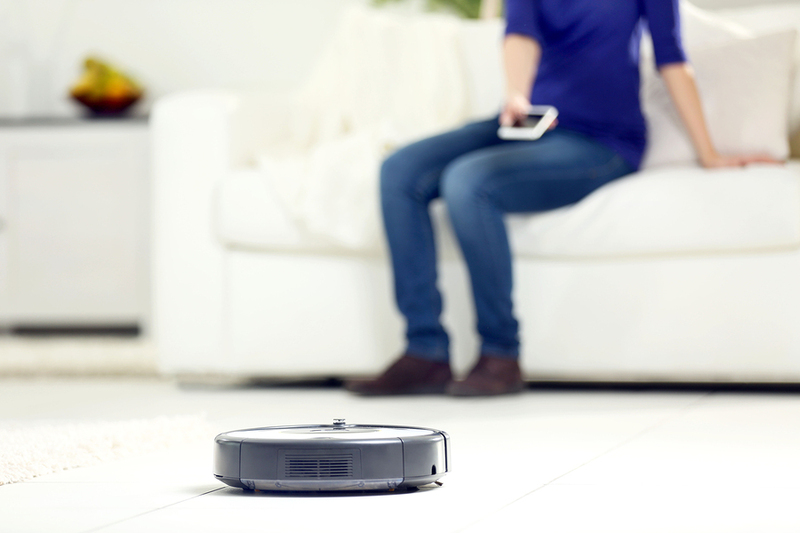 For hardware, theories on the increase in investments include strong hardware exits and the rise of crowd-funding platforms, such as Kickstarter and Indigogo, which lead to the $2.3 million backing of Jibo. While few robotics companies reach this level of crowd-funding success, successful campaigns appear to have a positive correlation to increased funding. Additional investments from the corporate sphere and their associated high-publicity announcements have also served to increase awareness among general public, investors, and entrepreneurs that robotics is a growing and worthwhile industry. While both hardware and robotic investments are growing each year, they still lag behind the percent of investments in less-risky segments of internet- specific (25% in 2014) and software companies (41% in 2014) according to PwC 2014 venture capital data. In stark contrast to these high percentages, only .07% of the $48.3 billion VC funding went to robotics. Comparing the hardware- based robotic companies to those in software and internet-services, the investments in the latter are less risky and have the ability to grow and scale quickly with less upfront investment. Although some investors are willing to take risks and bet on the future of robotics, the funding of millions of dollars pales in comparison to the billions being poured into other sectors. With less than 1% of VC going into the robotics industry, it begs the question: Why are venture capitalists skittish when it comes to robots? It boils down to perceived risk. William Santana Li, CEO of Knightscope, observes that most VCs believe “Hardware is too hard.” It requires expensive investments that appear risky when you consider that many emerging startups run on the fuel of hungry, yet relatively inexperienced entrepreneurs. And those who do have experience are unlikely to have developed the expertise needed to build a sustainable and scalable manufacturing operation. While hardware may be hard, there is a way to play it smart. The value of strategic investors and partners should not be underestimated. In what many consider to be an overly risky environment, strategics can provide the expertise needed to help accelerate robotics companies. Strategics with strong legacies in hardware bring operations infrastructure, knowledge, and foresight to help emerging startups commercialize. Furthermore, these strategics can de-risk the most challenging components of starting a hardware company, including the servicing, deployment, design for servicing, maintenance, manufacturing, and distribution. With Konica Minolta Business Innovation Center (BIC) as a strategic partner, Steve Cousins, CEO of Savioke, notes that they “gain a strong services infrastructure, capabilities, global reach, and scale.” Having a strong strategic investor or partner allows the Savioke team to focus on putting more Relay robots into the world without having to worry about scaling to support their growing customer base. Like any true partnership, the benefits flow both ways. Corporate strategics understand the necessity of staying innovative in today’s competitive market. At the Konica Minolta Business Innovation Center, “We are transforming Konica Minolta’s core business by focusing on industries that provide our customers the tools they need to stay ahead of the curve” says Ekta Sahasi, VP Konica Minolta BIC. The desire to access these disruptive industries like robotics, offers a strong incentive to ensure the investment companies become best-in-class. Unlike some venture capitalist firms, corporate strategics are investing in products that align with both the strategy of their business and are poised to produce financial returns. By aligning the success of the emerging companies with the strategy of the business, corporate strategics are especially invested in the success of the emerging company. There are many ways to connect with strategic investors. At Konica Minolta Business Innovation Center, we partner with emerging startups through investments, partnerships, co-development, and mentorships. We have invested in Knightscope, an autonomous crime-detecting robot that aims to reduce crime by empowering the community with data and security. Through our partnership with Savioke, an autonomous robot for the services industry, we have installed robots in hotels and created a service model to help scale. We also co-develop with our robotic industry companies to integrate complementary technology from our platform. For instance, we are working to have Sigsense, a maintenance-detecting software, to integrate their product into robots in order to predict maintenance needs. Finally, we have worked with accelerators such as Plug and Play to identify and mentor the emerging robotic startups. Konica Minolta is supporting the development of the robotic solutions that will transform the future. If you are an entrepreneur, investor, accelerator, or enthusiast, say hello and join our journey! Konica Minolta’s Business Innovation Centers (BIC) are established in five major regions around the world as a core engine of business transformation. The BIC mission is to gain a deeper understanding of customers’ needs and deliver the greatest value to the world. BIC North America fosters a portfolio of solutions in the areas of robotics, healthcare, connected intelligent ecosystems, workplace and enterprise solutions. BIC manages the entire lifecycle of new business development from ideation to creation of actual business lines. The rest of the Silicon Valley Robotics free report on service robotics is AVAILABLE HERE — or in instalments at Silicon Valley Robotics — featuring case studies and analysis from industry experts and investors. Venture Capital (VC) Funding for Robotics in 2014 | Hizook. (n.d.). Retrieved November 2, 2015. Deyle, T. (2015, January 20). Venture Capital (VC) Funding for Robotics in 2014 | Hizook. Quintero, C. (2015, September 14). 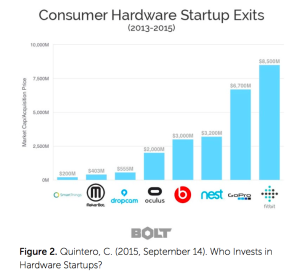 Who Invests in Hardware Startups? – Bolt Blog. Retrieved November 2, 2015. Crowe, S. (2015, February 13). 10 Most Funded Kickstarter Robots Ever – Robotics Trends. Retrieved November 2, 2015. Witheiler, M. (2014, December 14). 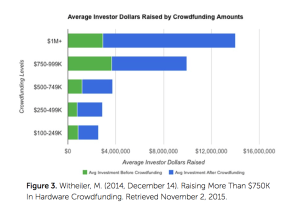 Raising More Than $750K In Hardware Crowdfunding. Retrieved November 2, 2015. Keay, A., & Komissarova, V. (2014, February 26). Valery Komissarova on when investing in robots is the right move. Retrieved November 2, 2015. Kokalitcheva, K. (2015, January 17). VCs invested $48.3B in 2014, highest level since 2000. Retrieved November 2, 2015.